Everyone knows about the spots that appear on the skin of the elderly. For us it is associated with old age. And as you do not want to grow old. This is particularly frightening for women, although for men the appearance of such spots also does not cause joy. This, so-called senile blemishes or, using medical terminology - senile lentigo. For the body, senile spots on the skin carry no danger. Much greater moral damage from them. After all, the appearance of these pigmented spots we associate with old age. Although this is not always the case. The cause of the appearance of pigmented spots is the accumulation on certain parts of the skin of a certain type of cells, the so-called melanocytes, which produce the pigment melanin. Where these cells are grouped, a pigmented spot appears. At a young age, most often appear pigmented spots on the face. The reasons for this may be different. This is a long stay in the sun, excessive uncontrolled use of various medications, abuse of cosmetics, especially poor quality, worsening of the liver and stomach, hormonal disorders (for example, in women during pregnancy). 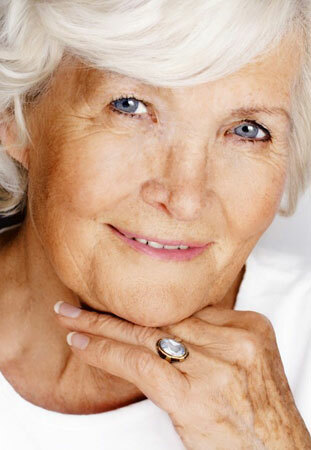 In older people, the appearance of pigmentation is caused by a decrease in the hormonal activity of the body with age. Excessive exposure to sunlight can further accelerate the process of senile lentigo, so senile pigment spots usually appear on those parts of the body that are exposed to direct sunlight. It's hands, shoulders, face. Pigmented spots appear more often in women than in men. But it is women who suffer most from their appearance. Because beauty is the most important for a woman, even if she is already over fifty. Old spots on the hands, cause her to panic. The best way to get rid of anything is to try to prevent it. And although it takes its time, and the natural process of aging can not be stopped, it can be slowed down. And some negative moments even avoided. Methods to combat senile pigmentation result from the causes of its appearance. You should try to be as little as possible in the active sun, close the open areas of the body or use protective creams. Take care of the condition of your internal organs and, above all, the liver. It is no coincidence that senile pigment spots are also called "liver spots". Rational, rich in vitamins, healthy sleep, physical activity - that's the key to preserving youthful skin. But if you still have age-related pigmentation, do not worry, in modern cosmetology there is a huge set of tools to combat it. It, first of all, bleaching cream which is in manufacture practically all known cosmetic firms. The composition of these creams includes a component of hydroquinone, which bleaches the skin. In the beauty salons you will be offered chemical peeling or laser resurfacing. These procedures are quite effective, although not cheap. If for you these procedures seem too expensive, in the arsenal of folk remedies you will find a large number of ways to whiten the skin. These are sour-milk products, fruit juices, castor oil. The effect from them will not appear right away, show a little patience, and it will definitely be.